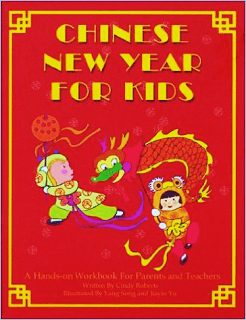 Celebrating the Chinese New Year is a terrific way to introduce kids to the concept of holidays around the world. Your students may not realize that people in other countries often celebrate completely different holidays, or they may celebrate the same holidays but have different holiday traditions. For example, most countries celebrate the new year on the first day of January, but the Chinese New Year can fall anywhere between January 20th and February 20th, and this year it begins on February 5th. New Years celebrations in most countries include festive events like parades and fireworks, but there are also many differences in New Year’s Day traditions. 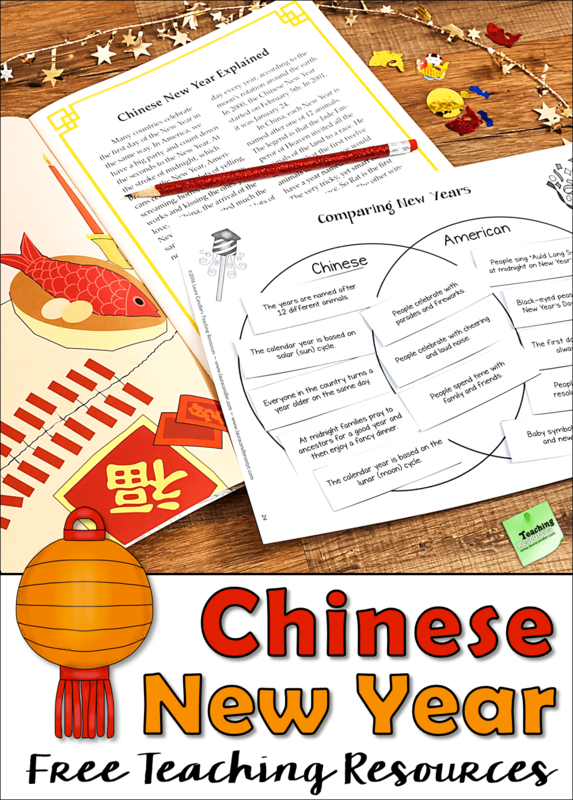 I’d like to share two activities I developed to help students explore the similarities and differences between the Chinese New Year and New Year traditions in the United States. 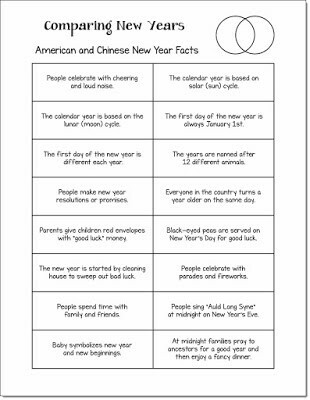 The first activity consists of a Venn diagram and facts to sort about the Chinese and American New Years. The second activity is a guided discussion based on the book Sam and the Lucky Money. Both of these activities can be found in my February Activities pack, which is free for my newsletter subscribers. 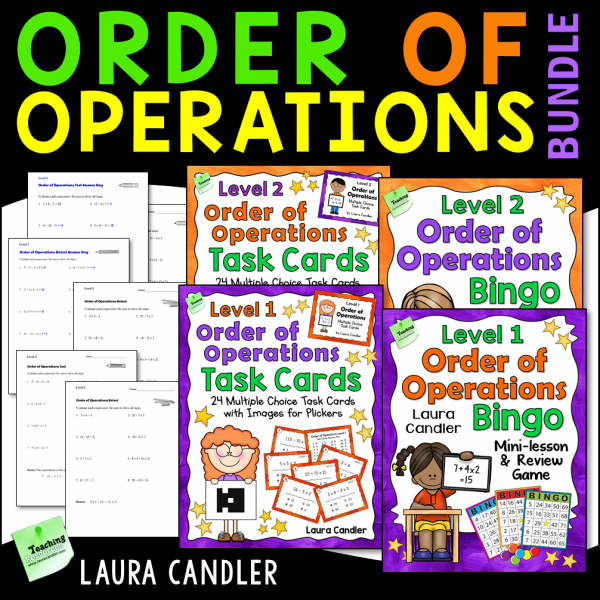 If you aren’t on my mailing list, click here to sign up for Candler’s Classroom Connections, and I’ll send you this free 26-page February Activities pack. 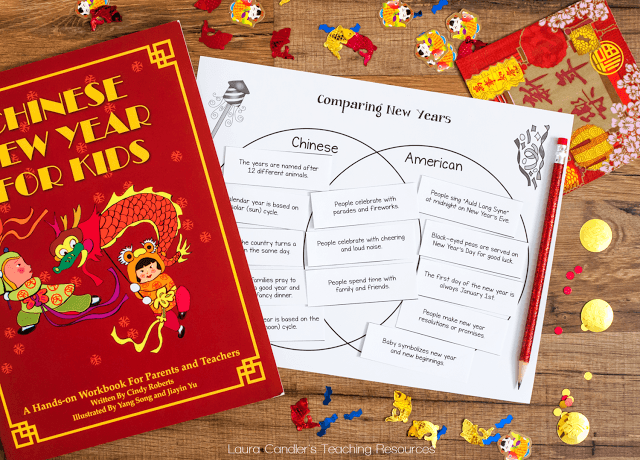 A Venn diagram is a great tool for exploring the similarities and differences between the Chinese New Year and New Year celebrations in other countries. Here’s a lesson outline you can use with upper elementary students, but feel free to modify it as needed with your own students. Before you begin, assign partners and ask students to sit with their partners. Tell the class that they will be learning about the Chinese New Year, and ask them to talk with their partners about anything they may have learned in the past about this holiday is similar to or different from the American New Year. Next, give each pair one copy of the American and Chinese Facts printable above, and have them cut apart the fact slips. 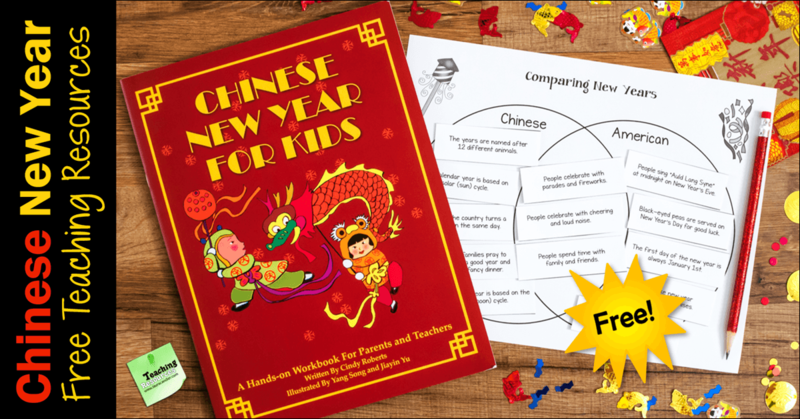 Then provide them with the Venn diagram printable or have them draw a Venn diagram with the two circles labeled Chinese New Year and American New Year. Explain that the Chinese New Year is similar to the American New Year in some ways, but it’s also different in other ways. In the first part of the lesson, they will make guesses about these similarities and differences, and later they will read and research to learn the correct answers. To begin the sorting activity, ask your students to shuffle the slips of paper containing the facts and to stack them face down next to the Venn diagram. Have them take turns flipping over the slips of paper and placing the facts on the Venn diagram in the correct locations. Before each fact is placed, the team must discuss where they think it goes and justify their answers. If the team can’t agree, the person who flipped over the fact makes the final decision. Leave the slips of paper in place for the next part of the activity, but cover the Venn diagram with a sheet of paper. 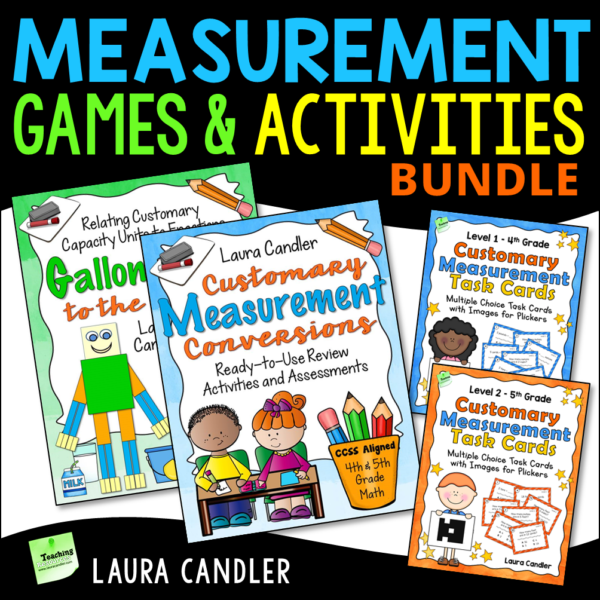 If you can’t complete the activity in one sitting, use a digital device to take a snapshot of each Venn diagram for future reference. 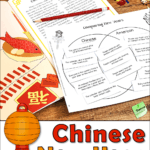 Read aloud aloud a children’s book like Chinese New Year for Kids or an informational text article about the Chinese New Year. As you read, ask your students to think about where they placed the slips of paper representing the facts about Chinese and American New Years. When you finish reading, ask students to uncover their Venn diagrams and move any slips they feel need to be changed. Before moving any of the fact slips, they need to discuss those changes with their partners. If there are any fact slips that were not mentioned in the book or article, allow time for students to research those facts online or in the school media center. An answer key is provided in the freebie. If your students discover other Chinese or American New Year traditions that are not described on the slips of paper, ask them to write the new facts directly on the Venn diagram. For homework, ask students to interview a parent, grandparent, or other family member to find out what they know about New Year traditions in their own country. They should also ask if their families have any special New Year customs or traditions of their own. When students return to school the next day, provide time for them to share what they learned and add any relevant details to their Venn diagrams. 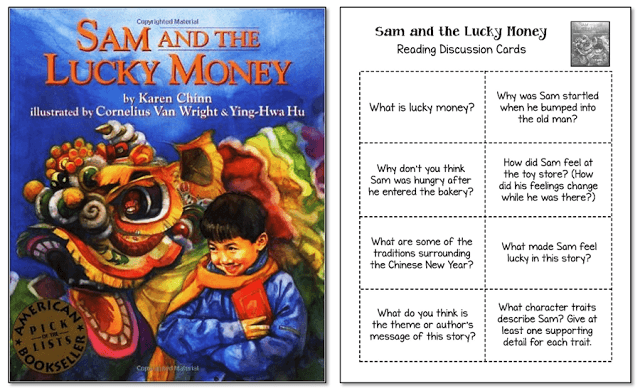 For a final look at Chinese New Year traditions, read and discuss the favorite children’s book, Sam and the Lucky Money. This story is based on the tradition of giving money in red envelopes on special occasions. In this touching story, a young boy named Sam learns what it means to be lucky. You can use these discussion cards to lead a whole class discussion, or use the cards with one of the cooperative learning discussion strategies I described in my post, Task Card Talk: 6 Strategies to Boost Learning. 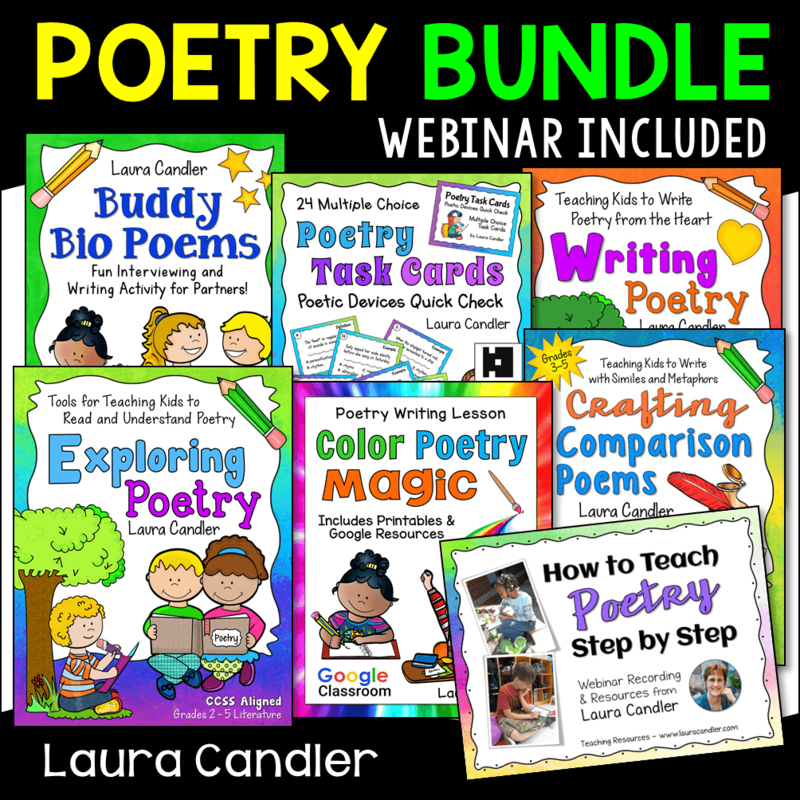 These activities are just a few of the free resources included in my February Activities pack. 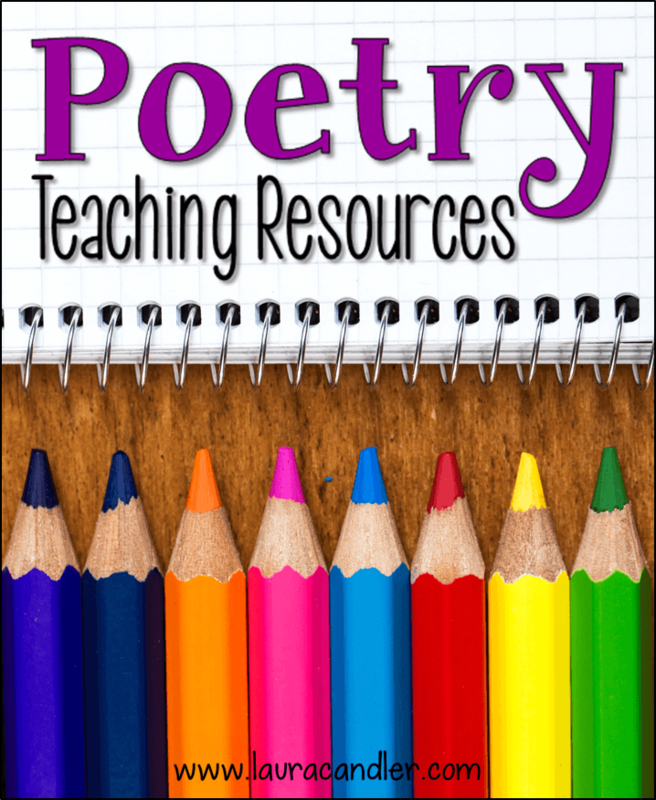 In addition, you’ll find loads of other printables and lessons for February, including resources for winter, Black History Month, International Friendship Month, and Valentine’s Day. Enjoy!